All songs produced at the Strip Farm 2008. 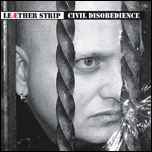 Claus Larsen proposes six months after its "Retention N#1" a new album entitled ' Civil Disobedience ' . Double album of his state (triple limited edition ) , it is the Leaether Strip at its best which we are entitled . A set of various titles Electro / Dark alternating overexcited ums pounding hard (' Civil Disobedience ', ' Going Nowhere ') , mid tempo supported ( the fantastic ' Stains ') and securities and quieter environments ( 'One Day' ) . Always supported by a sometimes screamed vocals and saturated just enough or more melodic , electro Danish fly is never bored with its well-chosen melodies, rumbling bass and even see Assistant d ? Female voice few pieces ('A Whore for Jesus ') like ' Shame of a Nation ' EP on 'Suicide Bomber ' . The new radius , we note for the first time in music Leaether Strip appearance guitar on some songs (' Could Ya Did Ya' ) which reinforces the front aspect of the songs. Larsen even split a reprise of the legendary ' Machineries of Joy' Die Krupps . A bonus CD , 'One Nine Eight Two' , the title of '1982 'refers to the year in which Claus bought his first synthesizer is available in limited edition. It consists of songs directly inspired by that time and performed with the famous ' Moog Prodigy ' and his old drum machine . A nostalgic return in early youth that the Danish book about a more intimate side of himself influenced by Fad Gadget, Soft Cell , but still close to its Leaether Strip.